The Mevo app has a simple built-in audio mixer that allows you to control audio levels from various sources in addition to the overall audio output to your audience. To adjust your audio source and levels, tap the More Options (•••) icon in the bottom right corner. Tap the microphone icon on the left side of the panel to enter the audio mixer. The bottom of this panel will show a slider, mute button, and levels monitor for your audio Output, which is the audio your audience will hear. By default, this includes a mix of the Mevo camera's built-in microphone and your primary mobile device's microphone or a plugged-in audio source. To adjust your individual audio sources, tap the mixer icon in the upper left corner of the panel. This will open a full-screen audio mixer. Below the output are sliders, mute options, and level monitors for both the Mevo built-in microphone ("Mevo") and your mobile device's microphone or plugged-in audio source ("iPhone Microphone" - this may be labeled as "iPad microphone" or "Phone microphone" depending on the device you are using). Both of these are sending audio to the program output by default. 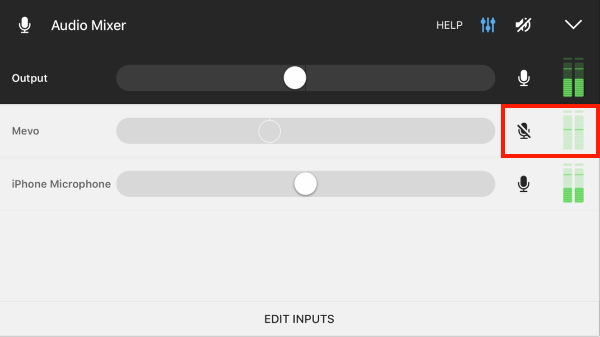 For each source, you can drag the slider to adjust the audio levels; dragging it left will lower the audio levels while dragging it right will make that source louder. You can also mute that source entirely by tapping the microphone icon to the right of it; the corresponding levels monitor will indicate there is no audio being sent out. 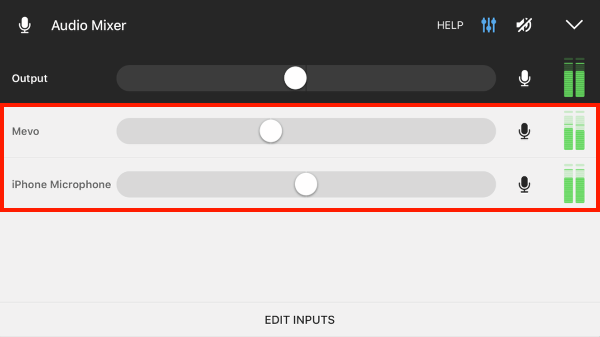 Below this is the ability to Edit Inputs. Tapping this brings you to a screen allowing you to connect and disconnect external audio sources with the Mevo. External sources include your mobile device, audio devices plugged into your mobile devices, and USB devices from the Mevo Boost or an OTG cable. By default, any detected sources are connected. Tap Connected to disconnect the audio source from Mevo so that it doesn't appear in the Audio Mixer; you can return here and tap Tap to Connect to reconnect the source. Please note that you cannot disconnect the built-in Mevo microphone. Tap Done to exit the screen. By default, the live audio preview (which allows you to hear your source audio through the mobile device's speakers) is muted. You can unmute it by tapping the speaker icon in the upper left corner. However, you may want to keep this muted during your stream; this will help avoid an echo in your stream and recording. To collapse the Audio Mixer, tap the blue mixer icon to reveal only the Output panel. To collapse the entire menu and return to the Live Production screen, tap the down arrow in the upper left corner. A general best practice is for your audio levels to peak about halfway to two-thirds of the way up the levels bar. This ensures a clear, audible sound that is not too loud. Audio that is over modulating is generally indicated by the top notches flashing red. This means you should lower your audio levels by dragging the audio slider to the left.